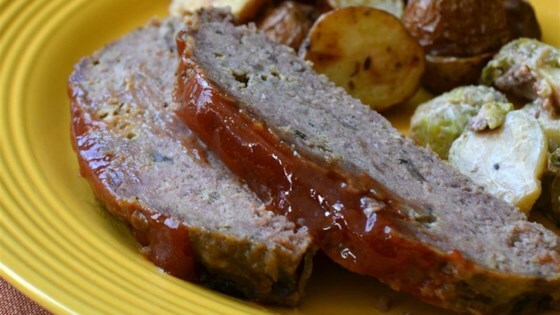 "This recipe is anything but regular old meatloaf! Everyone will love this moist version made in the slow cooker, with milk, mushrooms, and a little sage for extra flavor." Combine eggs, milk, bread crumbs, onion, salt, sage, and mushrooms in a large bowl. Crumble ground beef over mixture and stir well to combine. Shape into a round loaf; place in a 5-quart slow cooker. Cover and cook on Low until a meat thermometer reads 160 degrees F (71 degrees C), 5 to 6 hours. Whisk ketchup, brown sugar, mustard, and Worcestershire sauce in a small bowl; spoon sauce over meat loaf. Return to slow cooker and cook on Low until heated through, about 15 minutes. Let stand 10 minutes before cutting.